Southwest Coastal Bangladesh is one of the most vulnerable places in the world to climate change. Saline intrusion from rising sea levels, as well as large numbers of shrimp farms, has made the groundwater saline and therefore undrinkable. Households typically rely on pond water or other surface water sources for drinking. This water is unsafe to drink, leaving the people of this area with the options to boil their water, buy bottled water, or drink the unsafe water with no filtration method. With limited resources, many families are left in a difficult and dangerous situation. In the baseline survey of our pilot project beneficiaries, 84% of households got their drinking water from unprotected surface water sources. 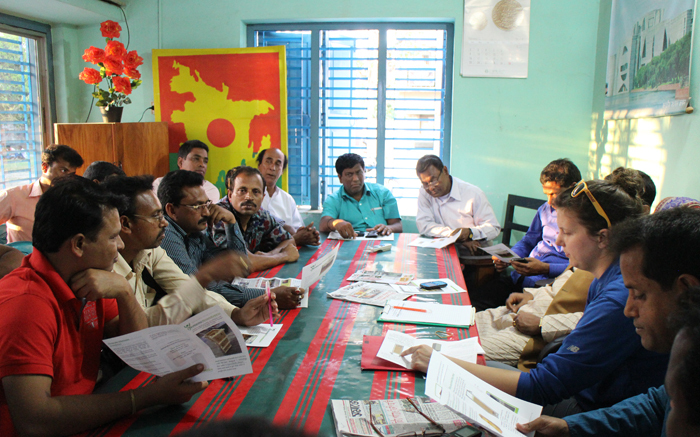 In February of 2014, OHorizons traveled to the village of Munshigonj, in the Satkhira District of Bangladesh, to kick off a training session with the local non-governmental organization (NGO), LEDARS (Local Environment Development and Agricultural Research Society). Our goal was to train multiple LEDARS staff members on how to build the OHorizons’ Wood Mold and subsequently cast concrete BioSand Filters, so that in the near future LEDARS would have the experience necessary to run a larger BSF production operation on their own. LEDARS had implemented a small BSF project in 2011 using the V8 steel mold. Although the filters were well received, LEDARS did not have the funds to continue the project. OHorizons learned about their BSF interest in the fall of 2013 and contacted them about the Wood Mold we had engineered. They were extremely interested in the idea and that we could greatly reduce their project startup costs. They had wanted to continue distributing BSFs for some time, but did not have the means to do so. Since they were not in use, their steel molds had rusted over and were no longer usable. Our organizations went to work discussing the outline of a pilot project that would test the feasibility of the Wood Mold in this region. This was to be the second field test OHorizons had conducted and the first time the filters made from the Wood Mold would be installed in households. Two of our staff members traveled to Bangladesh to conduct the Wood Mold training. Being in Bangladesh and interacting with the local people was an amazing experience; the Bangladeshi people, and our hosts at LEDARS, in particular, went above and beyond to make us feel comfortable and welcomed. Each morning we traveled by rickshaw to the LEDARS office and enjoyed the serene rural setting, a much-welcomed respite from the hustle and bustle of New York City, where our office is located. The LEDARS staff we trained: Ranajit, Asit, Sabina, and Hasan, were eager to get started and were very quickly able to understand the Construction Manual, despite a language barrier. In no time, they were making the Molds with little instruction and supervision. The project was ultimately a success, but there were, of course, some challenges that presented themselves along the way. For instance, another passenger on our flight into Dhaka mistakenly took home a bag we had packed that contained a circular saw. After extensive communicating, negotiating and waiting, the saw was returned to us 5 days later. On day 4 of our training! We made do by using a handsaw. While this was slower than a battery operated the circular saw, it proved to be effective and gave us confidence that the Wood Mold could be built in any environment. This was the first time the Mold had been partially built without the use of power tools and the first time it had been fully constructed with a handsaw. Since this trip, the Wood Mold has been built in completely off-grid locations, without the assistance of any electricity! The 4 trainees built 3 Wood Molds, completed the cuts for a fourth and fifth Mold, and poured 3 concrete filters. We had anticipated completing more filters in this time, but we were satisfied that the trainees had received sufficient training to be self-reliant moving forward and the organization already had ample experience working with BSFs made from a steel mold. Our trainees hard at work to deliver clean water access to their community! Asit, Sabina, & Hasan building the Wood Mold. Assembling the Wood Mold pieces. Filter recipients look on as the concrete filter is "de-molded" from its Wood Mold. Our final days were spent meeting with the local press and then traveling to several villages north of Dhaka to observe a few programs the NGO BRAC was running. Our Executive Director went on a thrilling 30 minute motorbike ride to meet with an assembly of 20 journalists and a local Member of Parliament (MP) from the Shyamnagar Sub-district. The group as a whole was very intrigued and impressed that OHorizons was working to bring clean drinking water to the region. OHorizons Executive Director Natalie Relich meets with a Member of Parliament and the local press. Once we had left our friends at LEDARS and arrived back in Dhaka, we set off to learn from BRAC. BRAC was started in Bangladesh in 1972 and has successfully grown to become the world's first international NGO based in the global south. They are a fantastic development organization that is dedicated to alleviating poverty by empowering the poor. Travelling to some of their project sites, we were able to observe them teaching groups of women about the importance of handwashing and to speak to them about the water, sanitation, and hygiene crisis facing the people of Bangladesh. A BRAC facilitator educates attendees on the importance of hand washing. After we left Bangladesh, the final Wood Molds were completed and within a few months all 50 filters had been delivered to the homes of local residents. Based on enthusiastic responses from the surveys we took 6 months after the installation of the BSFs and continued positive communications with LEDARS; in 2016, our partnership will locally produce 1000 filters and provide 5,000 Bangladeshis with clean water for life! If everything in this phase goes as planned, we anticipate scaling our production to much higher levels and adding clean water to the homes of tens of thousands of people! 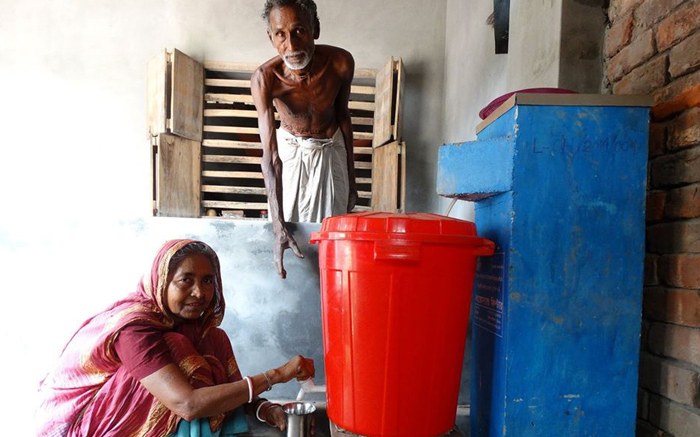 Access to clean water is an essential building block for a healthy community. LEDARS recently took 3rd place out of 115 international submissions for the Water Showcase Prize at the 2015 World Water Forum. We are very proud of our partner and the work they do in a variety of sectors; we’re excited to continue working with them! Thank you for reading and for your support, we truly appreciate it. A $10 donation to OHorizons can give a person in Bangladesh clean water for life! To make a donation to this initiative, please visit: www.ohorizons.org/donate. You can specify that you would like your donation to go towards Bangladesh in the Message box on the donation form.